"Our goal is to fully and finally remove a real threat to world peace and to America. Hopefully this can be done peacefully. Hopefully we can do this without any military action. Yet, if Iraq is to avoid military action by the international community, it has the obligation to prove compliance with all the world's demands. It's the obligation of Iraq." Iraq, the President said, still had the power to prevent war by "declaring and destroying all its weapons of mass destruction" -- but if Iraq did not declare and destroy those weapons, the President warned, the United States would "go into battle, as a last resort." It is safe to say that, at the time, it surprised almost no one when the Iraqis answered the President's demand by repeating their claim that in fact there were no weapons of mass destruction. As we now know, the Iraqis had in fact destroyed these weapons, probably years before George W. Bush's ultimatum: "the Iraqis" -- in the words of chief U.S. weapons inspector David Kaye -- "were telling the truth." As Americans watch their young men and women fighting in the third year of a bloody counterinsurgency war in Iraq -- a war that has now killed more than 1,600 Americans and tens of thousands of Iraqis -- they are left to ponder "the unanswered question" of what would have happened if the United Nations weapons inspectors had been allowed -- as all the major powers except the United Kingdom had urged they should be -- to complete their work. What would have happened if the UN weapons inspectors had been allowed to prove, before the U.S. went "into battle," what David Kaye and his colleagues finally proved afterward? Thanks to a formerly secret memorandum published by the London Sunday Times on May 1, during the run-up to the British elections, we now have a partial answer to that question. The memo, which records the minutes of a meeting of Prime Minister Tony Blair's senior foreign policy and security officials, shows that even as President Bush told Americans in October 2002 that he "hope[d] the use of force will not become necessary" -- that such a decision depended on whether or not the Iraqis complied with his demands to rid themselves of their weapons of mass destruction -- the President had in fact already definitively decided, at least three months before, to choose this "last resort" of going "into battle" with Iraq. Whatever the Iraqis chose to do or not do, the President's decision to go to war had long since been made. On July 23, 2002, eight months before American and British forces invaded, senior British officials met with Prime Minister Tony Blair to discuss Iraq. The gathering, similar to an American "principals meeting," brought together Geoffrey Hoon, the defense secretary; Jack Straw, the foreign secretary; Lord Goldsmith, the attorney general; John Scarlett, the head of the Joint Intelligence Committee, which advises the prime minister; Sir Richard Dearlove, also known as "C," the head of MI6 (the equivalent of the CIA); David Manning, the equivalent of the national security adviser; Admiral Sir Michael Boyce, the chief of the Defense Staff (or CDS, equivalent to the chairman of the Joint Chiefs); Jonathan Powell, Blair's chief of staff; Alastair Campbell, director of strategy (Blair's communications and political adviser); and Sally Morgan, director of government relations. By mid-July 2002, eight months before the war began, President Bush had decided to invade and occupy Iraq. Bush had decided to "justify" the war "by the conjunction of terrorism and WMD." Already "the intelligence and facts were being fixed around the policy." Many at the top of the administration did not want to seek approval from the United Nations (going "the UN route"). Few in Washington seemed much interested in the aftermath of the war. We have long known, thanks to Bob Woodward and others, that military planning for the Iraq war began as early as November 21, 2001, after the President ordered Secretary of Defense Donald Rumsfeld to look at "what it would take to protect America by removing Saddam Hussein if we have to," and that Secretary Rumsfeld and General Tommy Franks, who headed Central Command, were briefing American senior officials on the progress of military planning during the late spring and summer of 2002; indeed, a few days after the meeting in London leaks about specific plans for a possible Iraq war appeared on the front pages of the New York Times and the Washington Post. What the Downing Street memo confirms for the first time is that President Bush had decided, no later than July 2002, to "remove Saddam, through military action," that war with Iraq was "inevitable" -- and that what remained was simply to establish and develop the modalities of justification; that is, to come up with a means of "justifying" the war and "fixing" the "intelligence and facts...around the policy." The great value of the discussion recounted in the memo, then, is to show, for the governments of both countries, a clear hierarchy of decision-making. By July 2002 at the latest, war had been decided on; the question at issue now was how to justify it -- how to "fix," as it were, what Blair will later call "the political context." Specifically, though by this point in July the President had decided to go to war, he had not yet decided to go to the United Nations and demand inspectors; indeed, as "C" points out, those on the National Security Council -- the senior security officials of the U.S. government -- "had no patience with the UN route, and no enthusiasm for publishing material on the Iraqi regime's record." This would later change, largely as a result of the political concerns of these very people gathered together at 10 Downing Street. "The Foreign Secretary said he would discuss [the timing of the war] with Colin Powell this week. It seemed clear that Bush had made up his mind to take military action, even if the timing was not yet decided. But the case was thin. Saddam was not threatening his neighbors, and his WMD capability was less than that of Libya, North Korea or Iran." Given that Saddam was not threatening to attack his neighbors and that his weapons of mass destruction program was less extensive than those of a number of other countries, how does one justify attacking? Foreign Secretary Straw had an idea: "We should work up a plan for an ultimatum to Saddam to allow back in the UN weapons inspectors. This would also help with the legal justification for the use of force." The British realized they needed "help with the legal justification for the use of force" because, as the attorney general pointed out, rather dryly, "the desire for regime change was not a legal base for military action." Which is to say, the simple desire to overthrow the leadership of a given sovereign country does not make it legal to invade that country; on the contrary. And, said the attorney general, of the "three possible legal bases: self-defence, humanitarian intervention, or [United Nations Security Council] authorization," the first two "could not be the base in this case." In other words, Iraq was not attacking the United States or the United Kingdom, so the leaders could not claim to be acting in self-defense; nor was Iraq's leadership in the process of committing genocide, so the United States and the United Kingdom could not claim to be invading for humanitarian reasons.1 This left Security Council authorization as the only conceivable legal justification for war. But how to get it? "The Prime Minister said that it would make a big difference politically and legally if Saddam refused to allow in the UN inspectors. Regime change and WMD were linked in the sense that it was the regime that was producing the WMD.... If the political context were right, people would support regime change. The two key issues were whether the military plan worked and whether we had the political strategy to give the military plan the space to work." Here the inspectors were introduced, but as a means to create the missing casus belli. If the UN could be made to agree on an ultimatum that Saddam accept inspectors, and if Saddam then refused to accept them, the Americans and the British would be well on their way to having a legal justification to go to war (the attorney general's third alternative of UN Security Council authorization). Thus, the idea of UN inspectors was introduced not as a means to avoid war, as President Bush repeatedly assured Americans, but as a means to make war possible. War had been decided on; the problem under discussion here was how to make, in the prime minister's words, "the political context ...right." The "political strategy" -- at the center of which, as with the Americans, was weapons of mass destruction, for "it was the regime that was producing the WMD" -- must be strong enough to give "the military plan the space to work." Which is to say, once the allies were victorious the war would justify itself. The demand that Iraq accept UN inspectors, especially if refused, could form the political bridge by which the allies could reach their goal: "regime change" through "military action." Cheney, like other administration "hard-liners," feared "the UN route" not because it might fail but because it might succeed and thereby prevent a war that they were convinced had to be fought. The President now told Blair that he had decided "to go to the UN" and the prime minister, according to Woodward, "was relieved." 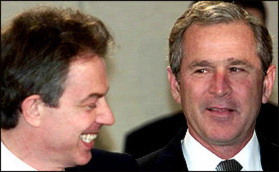 After the session with Blair, Bush later recounts to Woodward, he walked into a conference room and told the British officials gathered there that "your man has got cojones." ("And of course these Brits don't know what cojones are," Bush tells Woodward.) 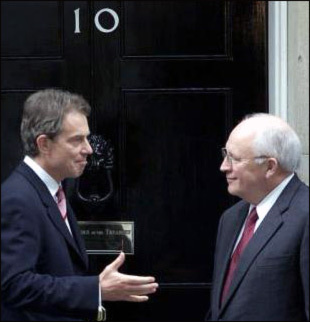 Henceforth this particular conference with Blair would be known, Bush declares, as "the cojones meeting." That September the attempt to sell the war began in earnest, for, as White House Chief of Staff Andrew Card had told the New York Times in an unusually candid moment, "You don't roll out a new product in August." At the heart of the sales campaign was the United Nations. Thanks in substantial part to Blair's prodding, George W. Bush would come before the UN General Assembly on September 12 and, after denouncing the Iraqi regime, announce that "we will work with the UN Security Council for the necessary resolutions." The main phase of public diplomacy -- giving the war a "political context," in Blair's phrase -- had begun. Though "the UN route" would be styled as an attempt to avoid war, its essence, as the Downing Street memo makes clear, was a strategy to make the war possible, partly by making it politically palatable. "We heard loud and clear during the negotiations about 'automaticity' and 'hidden triggers' -- the concerns that on a decision so crucial we should not rush into military action.... Let me be equally clear.... There is no 'automaticity' in this Resolution. If there is a further Iraqi breach of its disarmament obligations, the matter will return to the Council for discussion as required.... We would expect the Security Council then to meet its responsibilities." Vice President Cheney could have expected no worse. Having decided to travel down "the UN route," the Americans and British would now need a second resolution to gain the necessary approval to attack Iraq. Worse, Saddam frustrated British and American hopes, as articulated by Blair in the July 23 meeting, that he would simply refuse to admit the inspectors and thereby offer the allies an immediate casus belli. Instead, hundreds of inspectors entered Iraq, began to search, and found...nothing. January, which Defence Secretary Hoon had suggested was the "most likely timing in U.S. minds for military action to begin," came and went, and the inspectors went on searching. Where would this "dead end" be found, however, and who would determine that it had been found? Would it be the French, or the Americans? The logical flaw that threatened the administration's policy now began to become clear. Had the inspectors found weapons, or had they been presented with them by Saddam Hussein, many who had supported the resolution would argue that the inspections regime it established had indeed begun to work -- that by multilateral action the world was succeeding, peacefully, in "disarming Iraq." As long as the inspectors found no weapons, however, many would argue that the inspectors "must be given time to do their work" -- until, in Chirac's words, they "came to a dead end." However that point might be determined, it is likely that, long before it was reached, the failure to find weapons would have undermined the administration's central argument for going to war -- "the conjunction," as "C' had put it that morning in July, "of terrorism and WMD." And as we now know, the inspectors would never have found weapons of mass destruction. As the gap between administration rhetoric about enormous arsenals -- "we know where they are," asserted Donald Rumsfeld -- and the inspectors' empty hands grew wider, that gap, as Cheney had predicted, had the effect in many quarters of undermining the credibility of the United Nations process itself. The inspectors' failure to find weapons in Iraq was taken to discredit the worth of the inspections, rather than to cast doubt on the administration's contention that Saddam possessed large stockpiles of weapons of mass destruction. Oddly enough, Saddam's only effective strategy to prevent war at this point might have been to reveal and yield up some weapons, thus demonstrating to the world that the inspections were working. As we now know, however, he had no weapons to yield up. As Blix remarks, "It occurred to me [on March 7] that the Iraqis would be in greater difficulty if...there truly were no weapons of which they could "yield possession.'" The fact that, in Blix's words, "the UN and the world had succeeded in disarming Iraq without knowing it" -- that the UN process had been successful --meant, in effect, that the inspectors would be discredited and the United States would go to war. President Bush would do so, of course, having failed to get the "second resolution" so desired by his friend and ally, Tony Blair. Blair had predicted, that July morning on Downing Street, that the "two key issues were whether the military plan worked and whether we had the political strategy to give the military plan the space to work." He seems to have been proved right in this. In the end his political strategy only half worked: the Security Council's refusal to vote a second resolution approving the use of force left "the UN route" discussed that day incomplete, and Blair found himself forced to follow the United States without the protection of international approval. Had the military plan "worked" -- had the war been short and decisive rather than long, bloody, and inconclusive -- Blair would perhaps have escaped the political damage the war has caused him. A week after the Downing Street memo was published in the Sunday Times, Tony Blair was reelected, but his majority in Parliament was reduced, from 161 to 67. The Iraq war, and the damage it had done to his reputation for probity, was widely believed to have been a principal cause. In the United States, on the other hand, the Downing Street memorandum has attracted little attention. As I write, no American newspaper has published it and few writers have bothered to comment on it. The war continues, and Americans have grown weary of it; few seem much interested now in discussing how it began, and why their country came to fight a war in the cause of destroying weapons that turned out not to exist. For those who want answers, the Bush administration has followed a simple and heretofore largely successful policy: blame the intelligence agencies. Since "the intelligence and facts were being fixed around the policy" as early as July 2002 (as "C," the head of British intelligence, reported upon his return from Washington), it seems a matter of remarkable hubris, even for this administration, that its officials now explain their misjudgments in going to war by blaming them on "intelligence failures" -- that is, on the intelligence that they themselves politicized. Still, for the most part, Congress has cooperated. Though the Senate Intelligence Committee investigated the failures of the CIA and other agencies before the war, a promised second report that was to take up the administration's political use of intelligence -- which is, after all, the critical issue -- was postponed until after the 2004 elections, then quietly abandoned. "The aide said that guys like me [i.e., reporters and commentators] were 'in what we call the reality-based community,' which he defined as people who 'believe that solutions emerge from your judicious study of discernible reality.' I nodded and murmured something about enlightenment principles and empiricism. He cut me off. 'That's not the way the world really works anymore,' he continued. 'We're an empire now, and when we act, we create our own reality. And while you're studying that reality -- judiciously, as you will -- we'll act again, creating other new realities, which you can study too, and that's how things will sort out. We're history's actors... and you, all of you, will be left to just study what we do.'" 1. The latter charge might have been given as a reason for intervention in 1988, for example, when the Iraqi regime was carrying out its Anfal campaign against the Kurds; at that time, though, the Reagan administration -- comprising many of the same officials who would later lead the invasion of Iraq -- was supporting Saddam in his war against Iran and kept largely silent. The second major killing campaign of the Saddam regime came in 1991, when Iraqi troops attacked Shiites in the south who had rebelled against the regime in the wake of Saddam's defeat in the Gulf War; the first Bush administration, despite President George H.W. Bush's urging Iraqis to "rise up against the dictator, Saddam Hussein," and despite the presence of hundreds of thousands of American troops within miles of the killing, stood by and did nothing. See Ken Roth, "War in Iraq: Not a Humanitarian Intervention" (Human Rights Watch, January 2004). 3. See Woodward, Plan of Attack, pp. 177-178. 4. See "Chirac Makes His Case on Iraq," an interview with Christiane Amanpour, CBS News, March 16, 2003. "There was no point in seeking to convert the intellectuals. For intellectuals would never be converted and would anyway always yield to the stronger, and this will always be 'the man in the street.' Arguments must therefore be crude, clear and forcible, and appeal to emotions and instincts, not the intellect. Truth was unimportant and entirely subordinate to tactics and psychology." I thought of this quotation when I first read the Downing Street memorandum; but I had first looked it up several months earlier, on December 14, 2004, after I had seen the images of the newly reelected President George W. Bush awarding the Medal of Freedom, the highest civilian honor the United States can bestow, to George Tenet, the former director of central intelligence; L. Paul Bremer, the former head of the Coalition Provisional Authority in Iraq; and General (ret.) Tommy Franks, the commander who had led American forces during the first phase of the Iraq war. Tenet, of course, would be known to history as the intelligence director who had failed to detect and prevent the attacks of September 11 and the man who had assured President Bush that the case for Saddam's possession of weapons of mass destruction was "a slam dunk." Franks had allowed the looting of Baghdad and had generally done little to prepare for what would come after the taking of Baghdad. ("There was little discussion in Washington," as "C" told the Prime Minister on July 23, "of the aftermath after military action.") Bremer had dissolved the Iraqi army and the Iraqi police and thereby created 400,000 or so available recruits for the insurgency. One might debate their ultimate responsibility for these grave errors, but it is difficult to argue that these officials merited the highest recognition the country could offer. Of course truth, as the master propagandist said, is "unimportant and entirely subordinate to tactics and psychology." He of course would have instantly grasped the psychological tactic embodied in that White House ceremony, which was one more effort to reassure Americans that the war the administration launched against Iraq has been a success and was worth fighting. That barely four Americans in ten are still willing to believe this suggests that as time goes on and the gap grows between what Americans see and what they are told, membership in the "reality-based community" may grow along with it. We will see. Still, for those interested in the question of how our leaders persuaded the country to become embroiled in a counterinsurgency war in Iraq, the Downing Street memorandum offers one more confirmation of the truth. For those, that is, who want to hear.